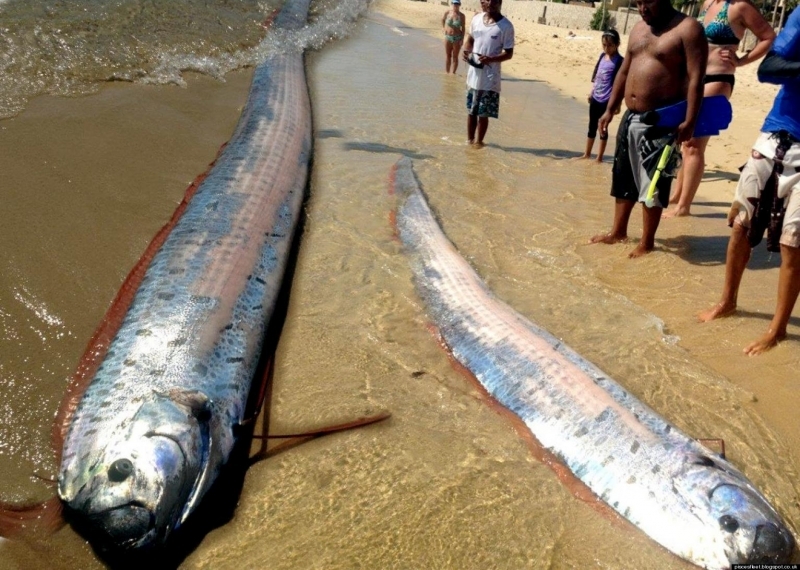 The strange-looking Oarfish is the longest bony fish in the ocean. 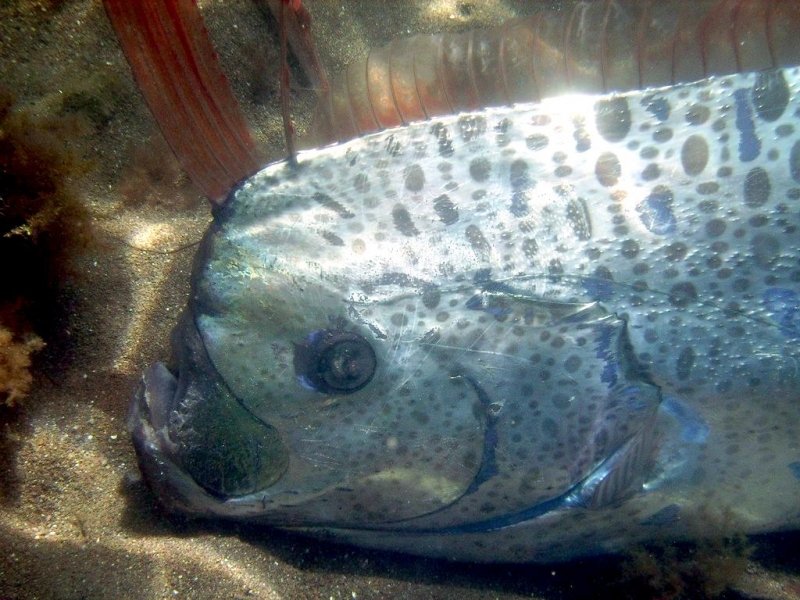 It is a member of the Regalecidae family of fishes and the name Regalecidae is derived from the Latin word “regalis” meaning “royal”. 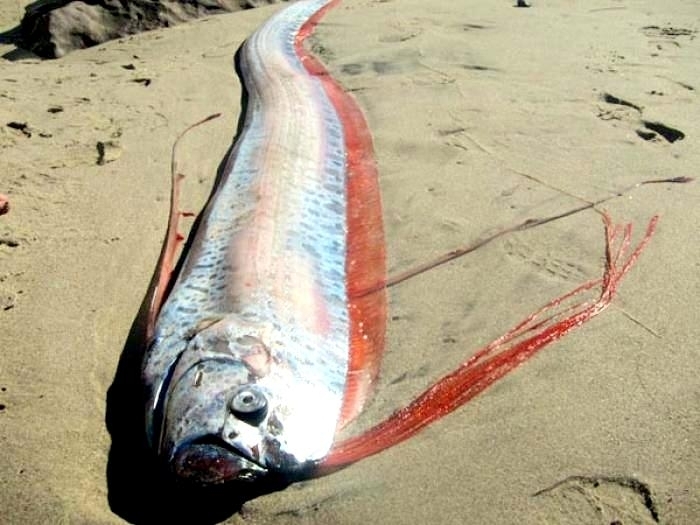 The origin of the Oarfish name is unknown, but may refer to the oar-shaped body or the long, oar-like pelvic fins. 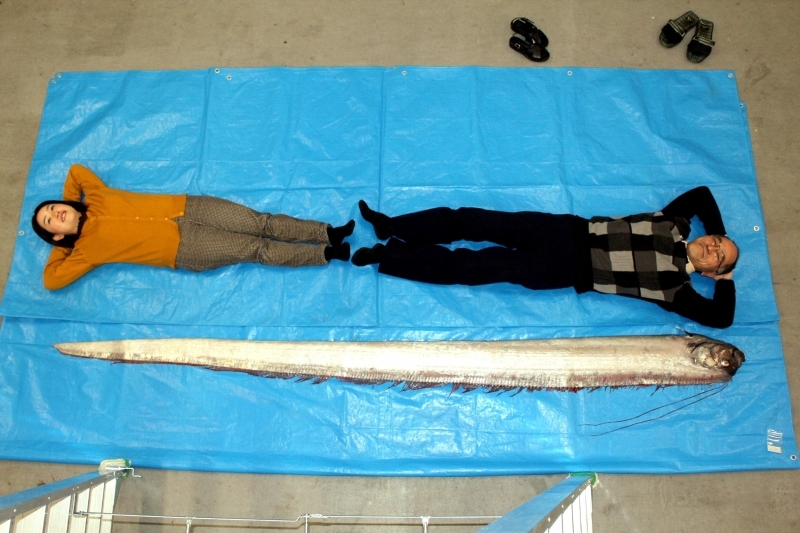 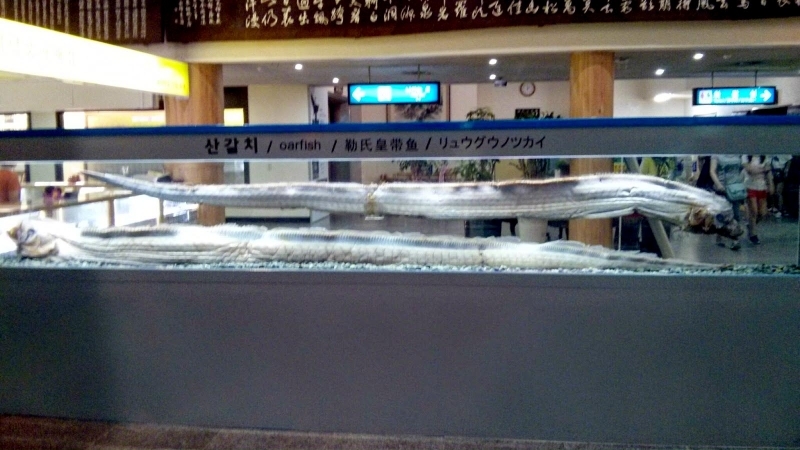 Because of its long, thin shape, the Oarfish is sometimes known as the Ribbonfish. 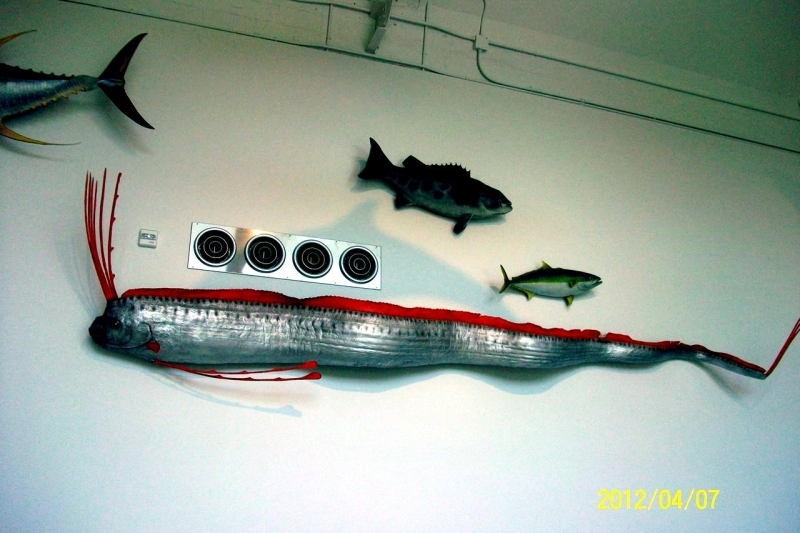 It is also commonly referred to as the “King of Herrings”. 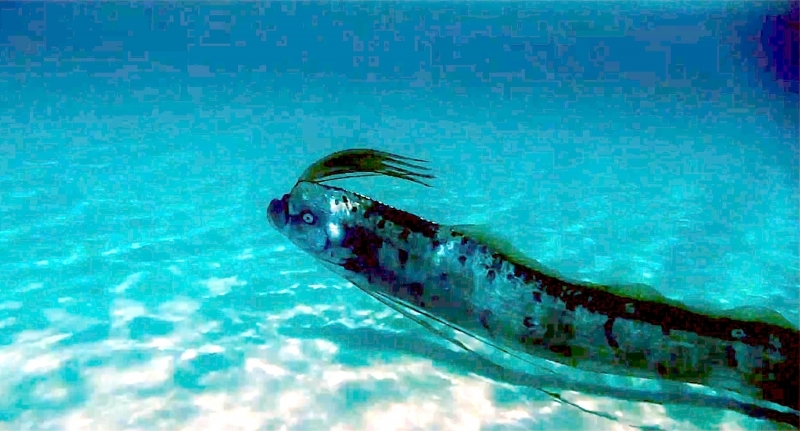 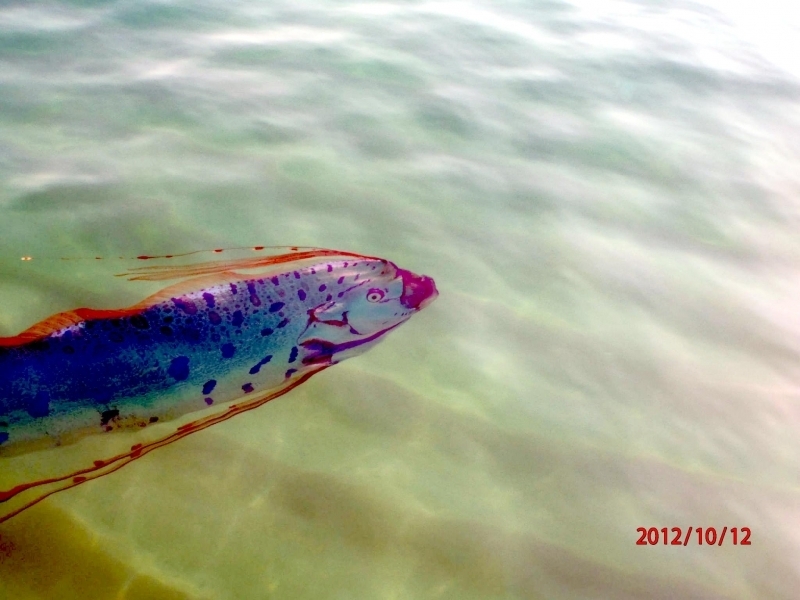 Even though it is a deep water species, it is not too uncommon to see a Oarfish. 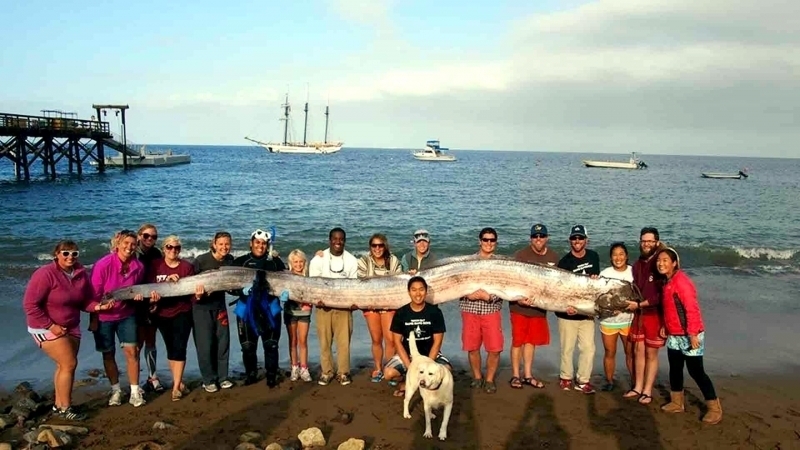 These unusual creatures have been known to wash ashore on beaches after storms, providing endless hours of fascination for curious onlookers. 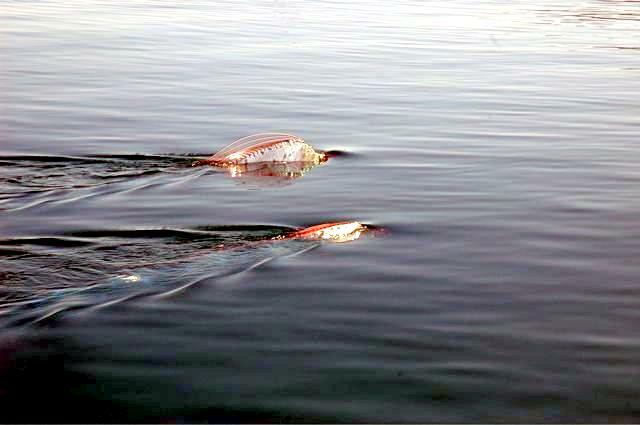 They also have a habit of floating near the surface of the water when they are sick or dying. 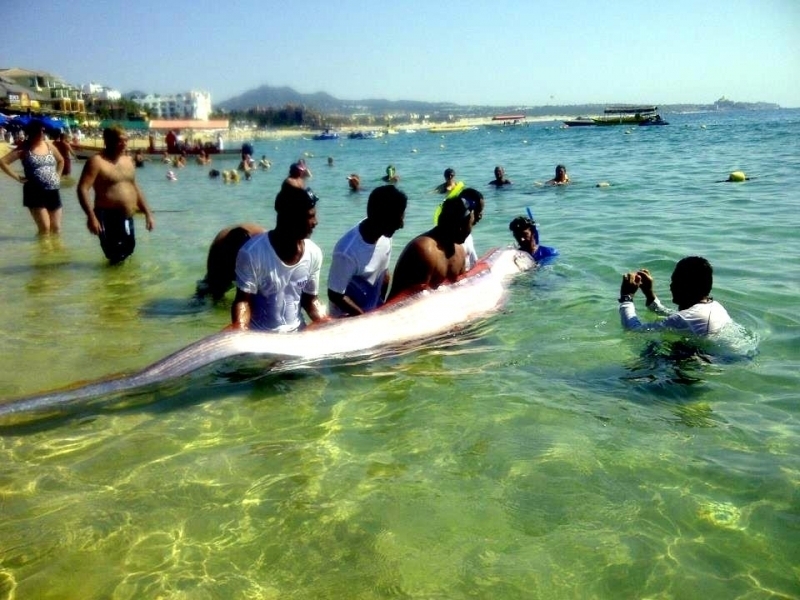 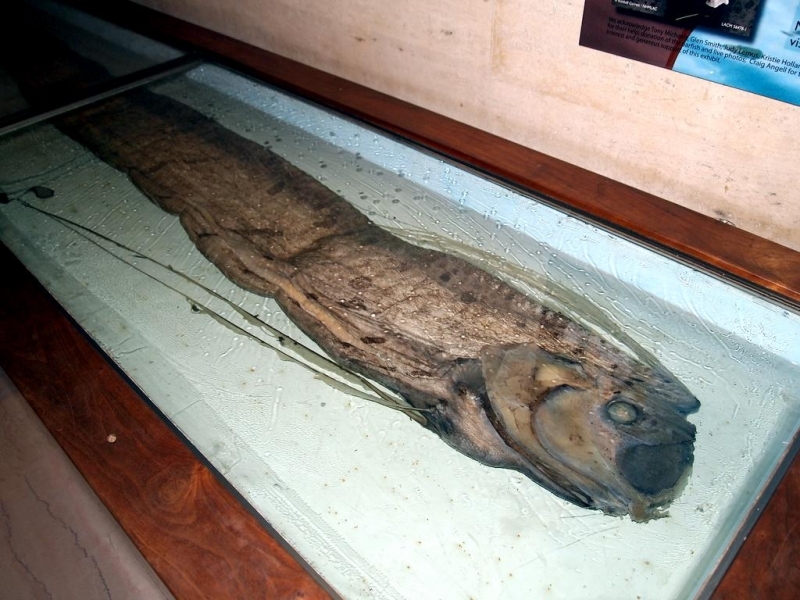 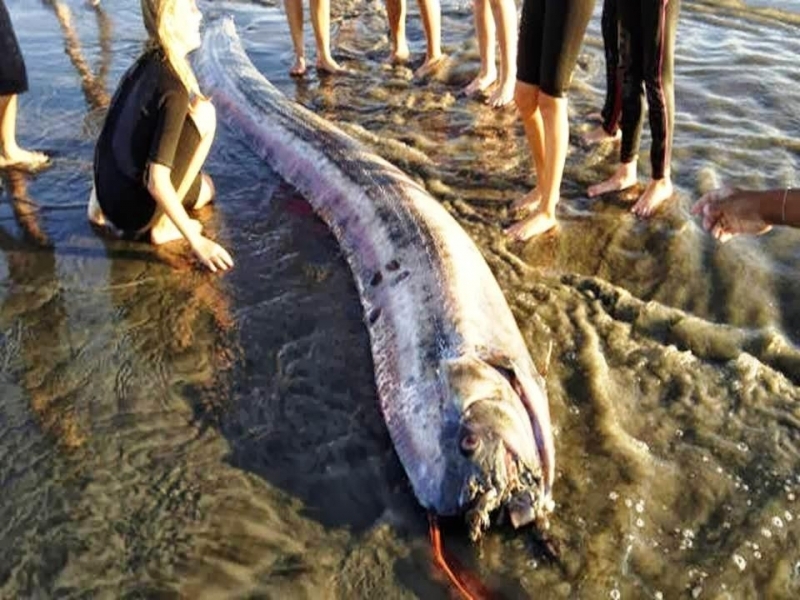 Because of this, it is believed that the Oarfish may be responsible for many of the legendary sightings of sea monsters & sea serpents by ancient mariners and beach goers. 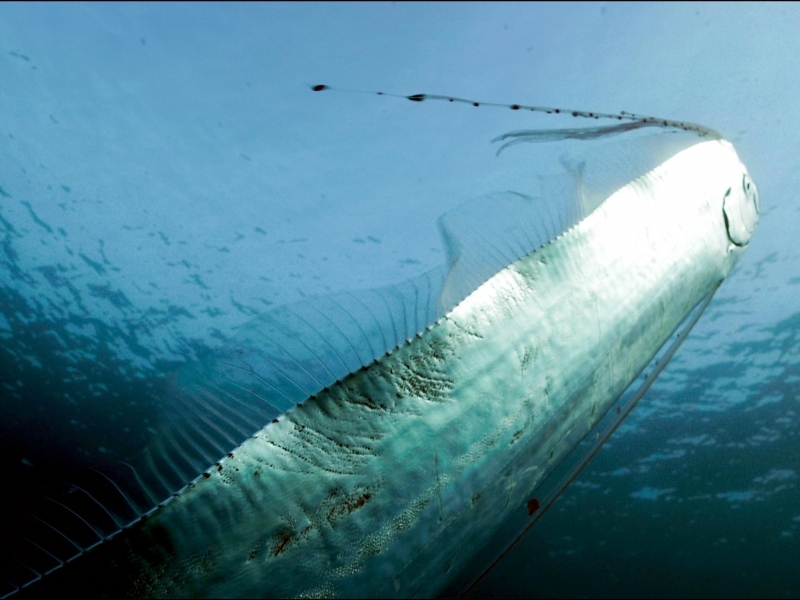 Although it is fished for sport as a game fish, the Oarfish is not usually fished commercially because its gelatinous flesh is not considered edible. 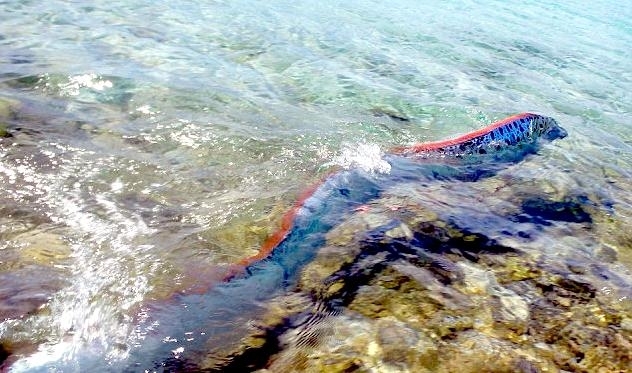 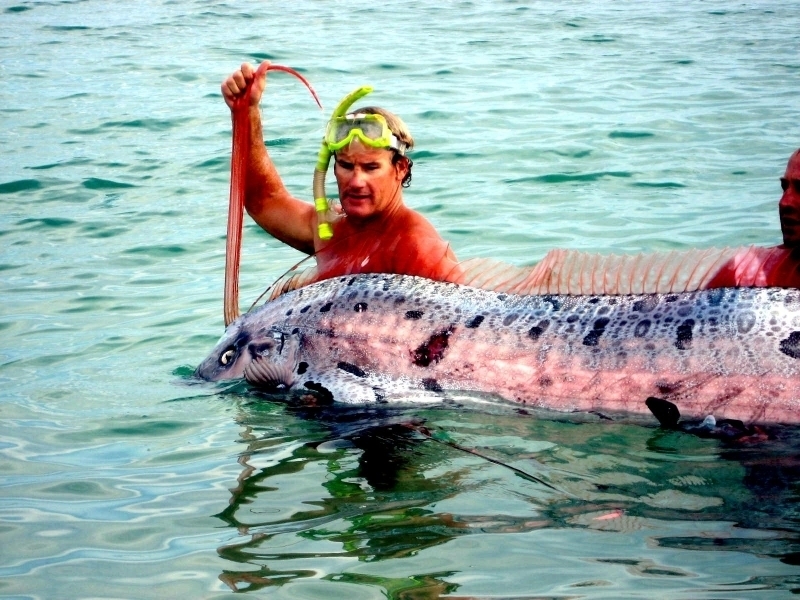 The most noticeable feature of the Oarfish is its extremely long, ribbon-like body. 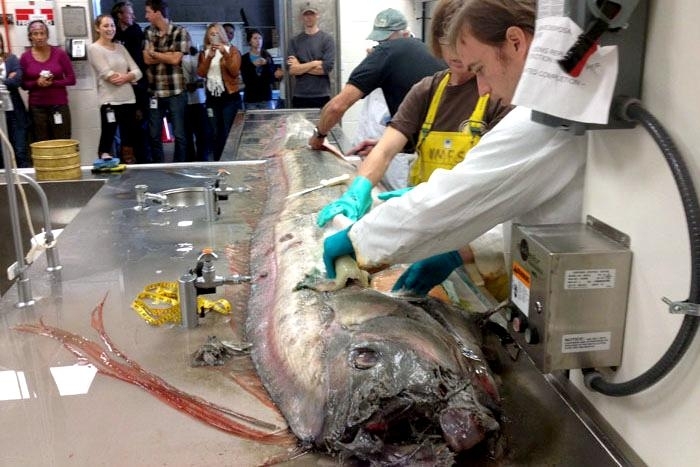 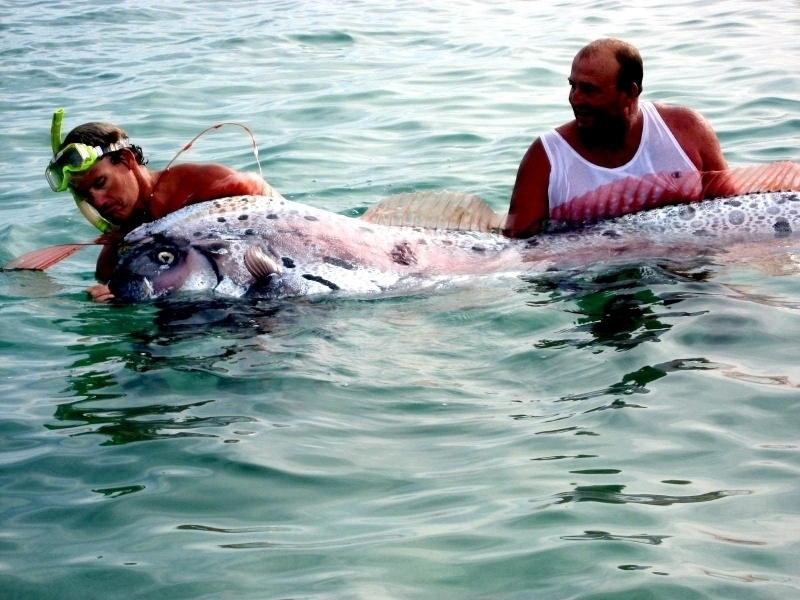 These fish can reach a length of over 50 feet and weigh as much as 600 pounds. 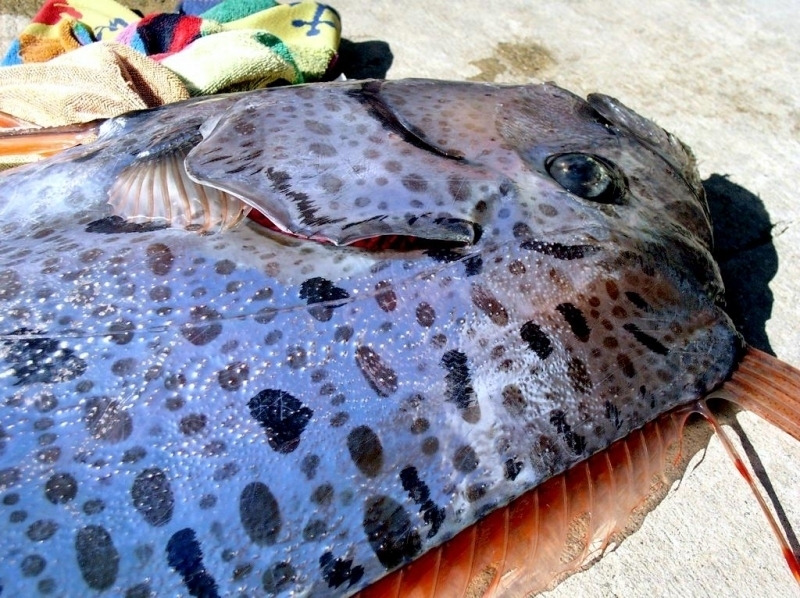 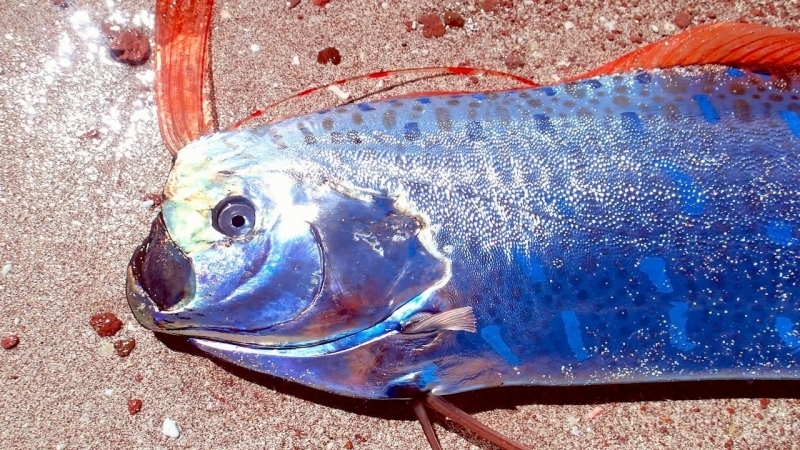 Its scaleless body is covered with a silver to silvery-blue skin and is topped with an ornate, red dorsal fin that resembles a decorative headdress. 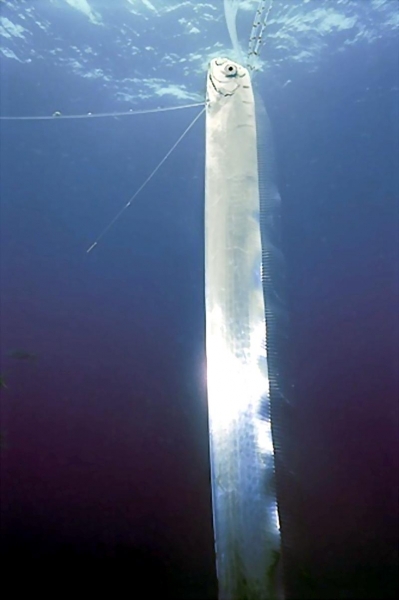 This dorsal fin runs the entire length of the fish, with a tiny spine projecting above each of over 400 individual fin rays. 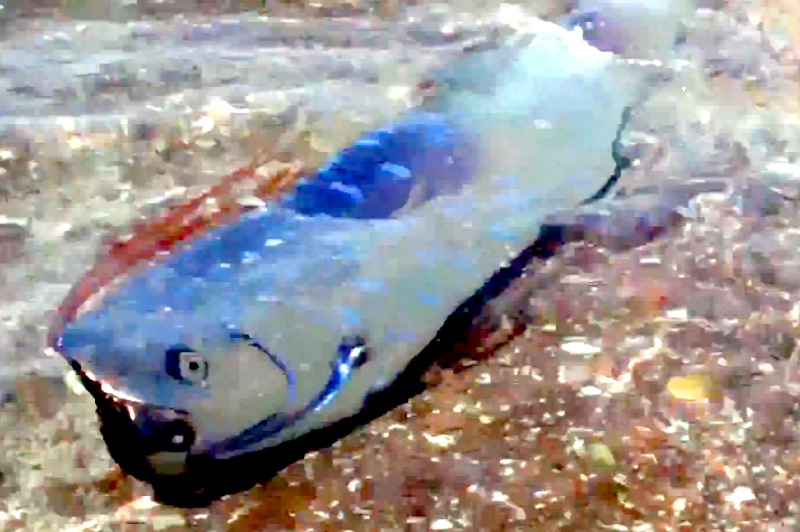 The pelvic fins of this fish are elongated and similarly colored. 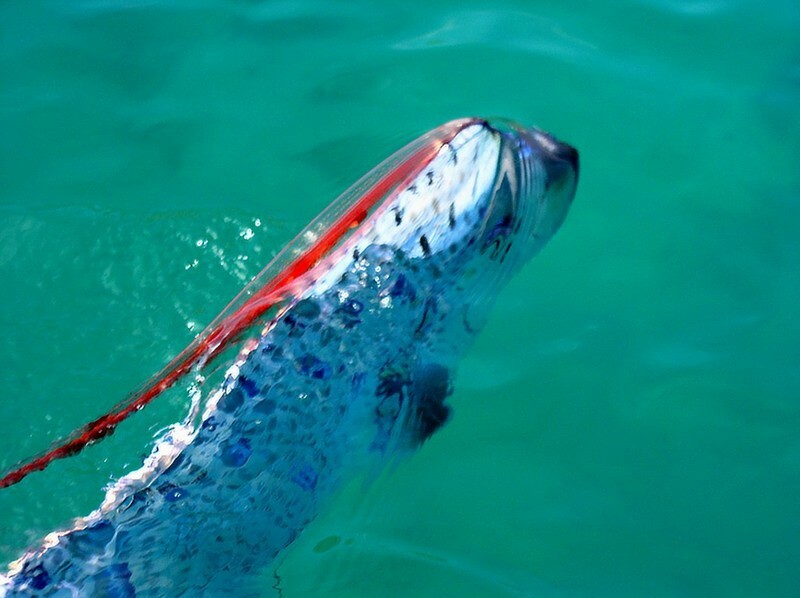 The Oarfish has a small mouth with no visible teeth. 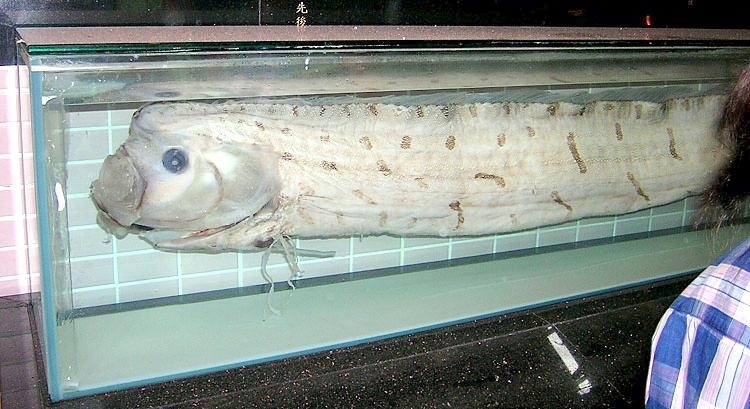 Their diet consists mainly of plankton, small crustaceans and small squid that they strain from the water using specially formed gill rakes in their mouth. 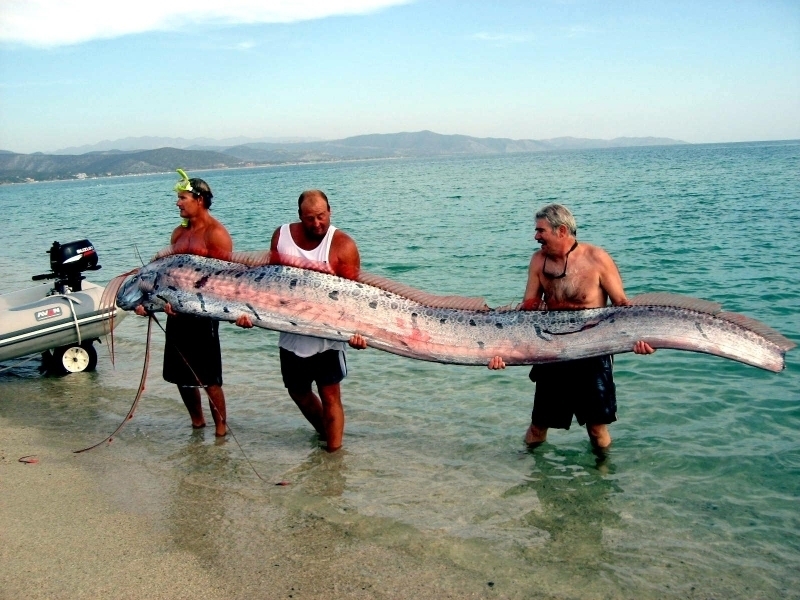 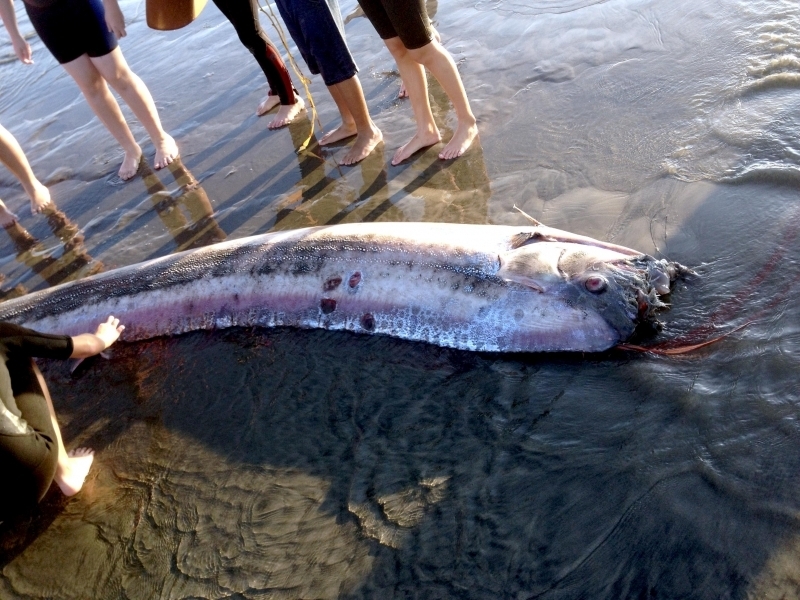 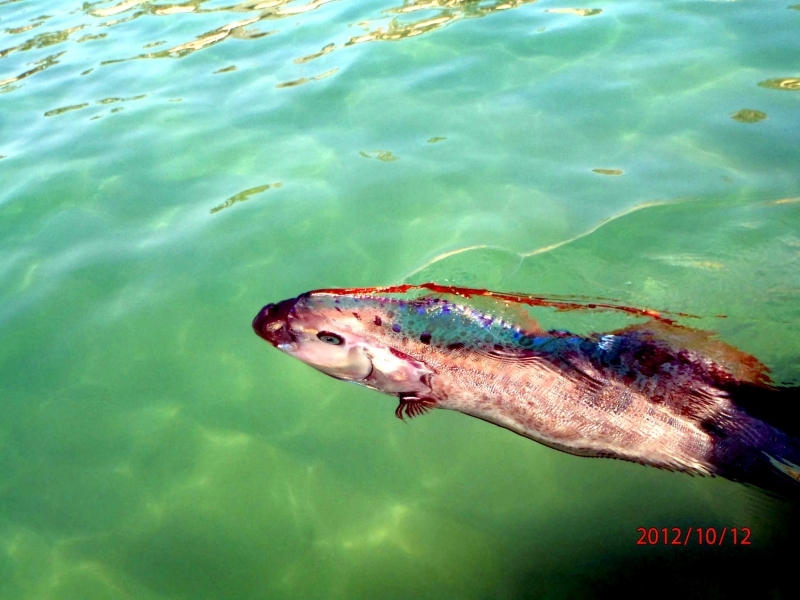 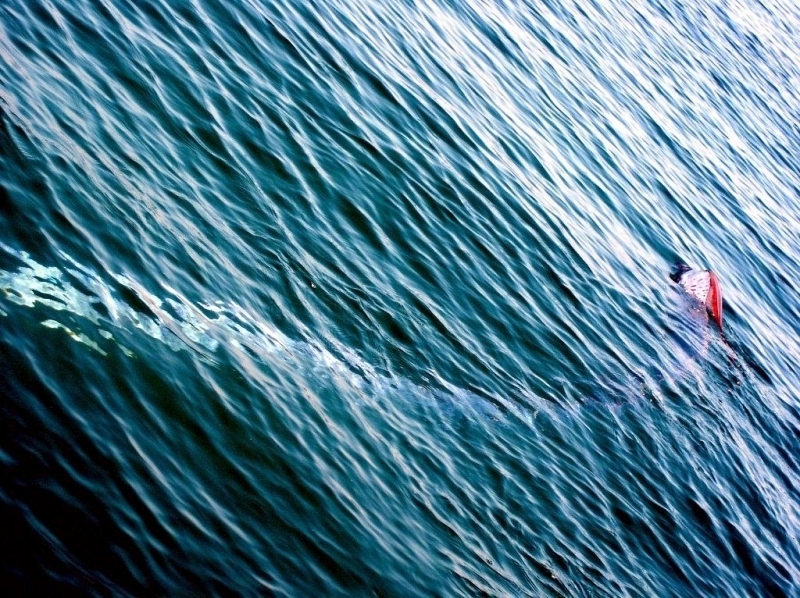 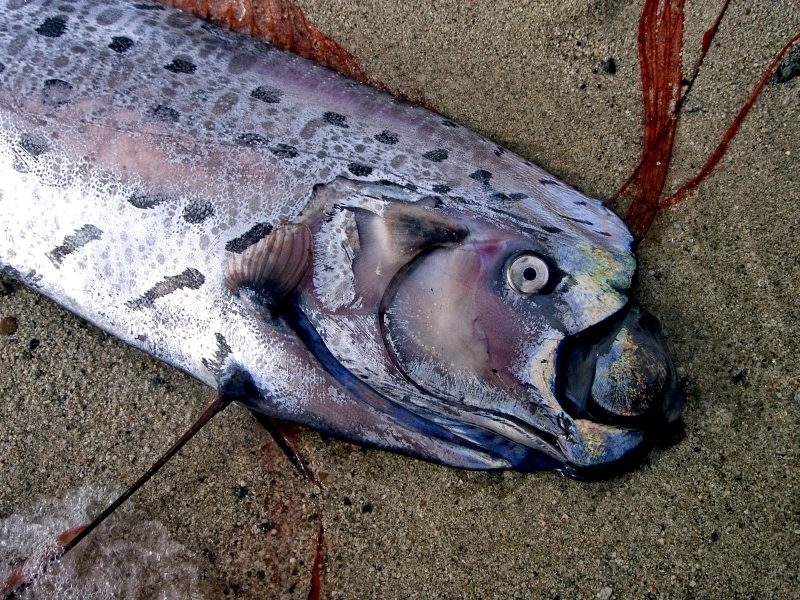 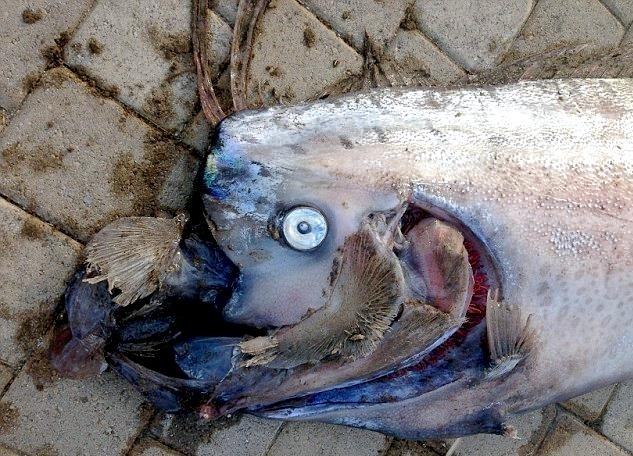 In turn, the Oarfish may be a food source for larger ocean carnivores such as sharks. 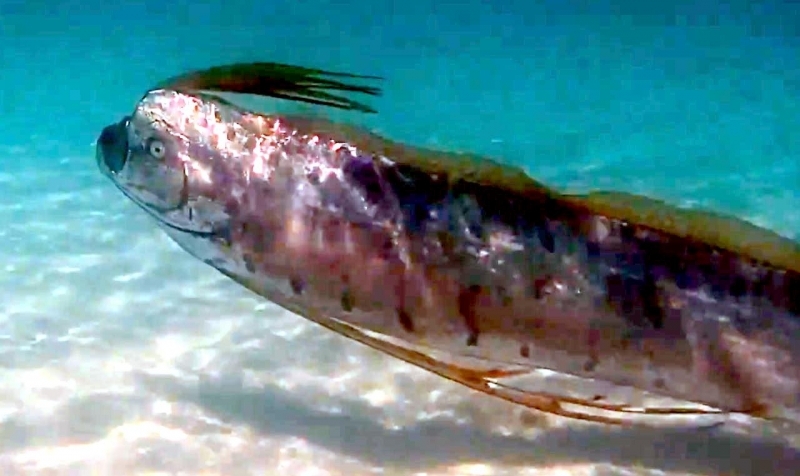 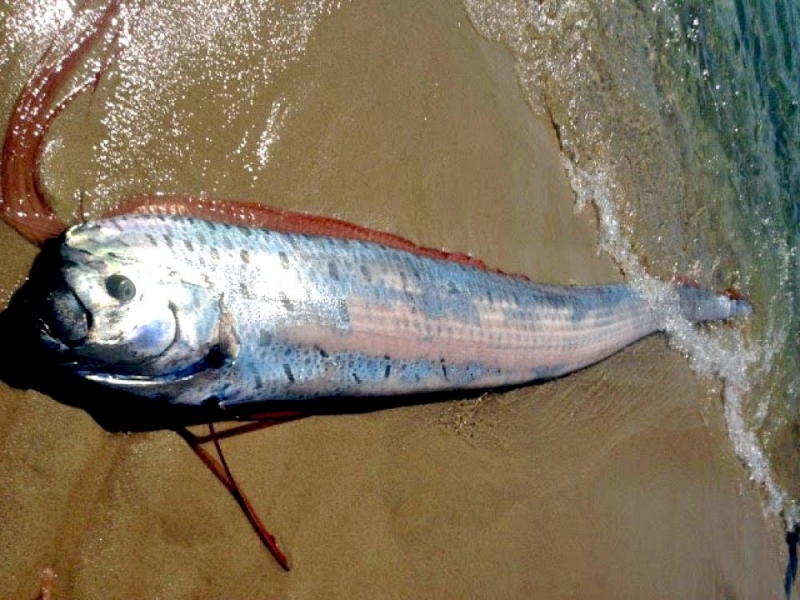 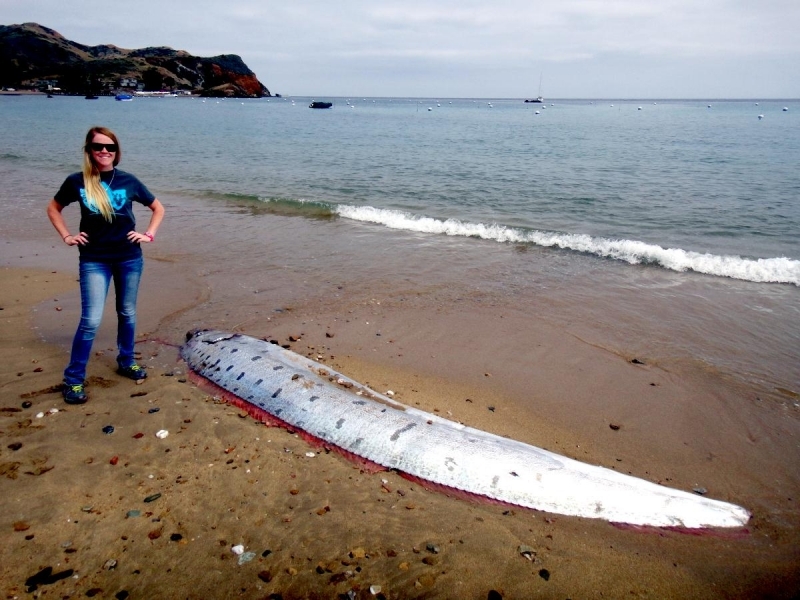 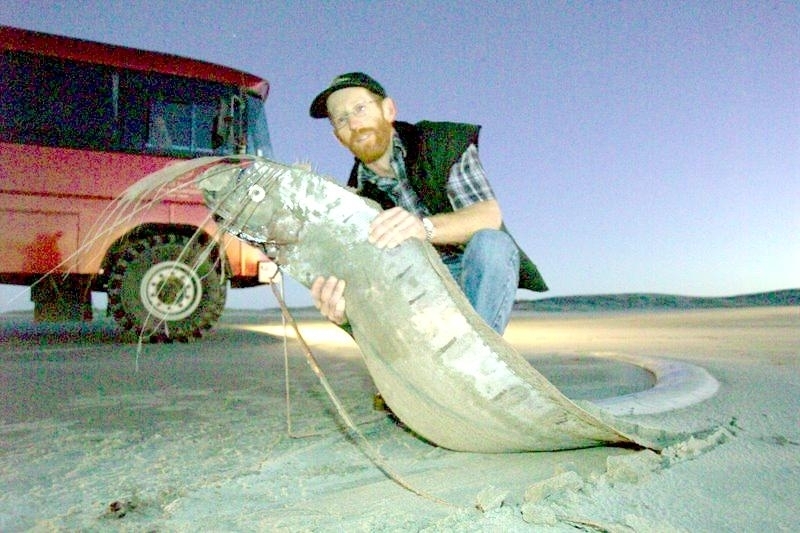 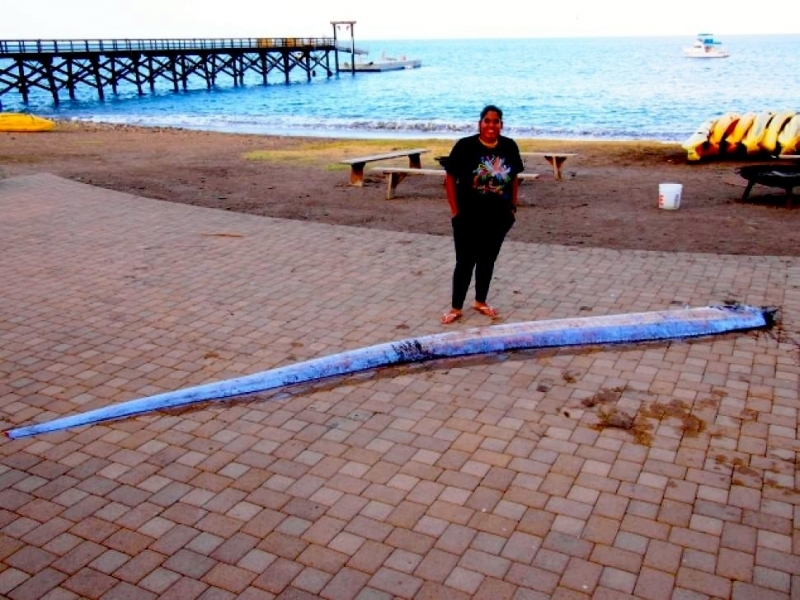 Almost everything we know about the Oarfish has been learned from specimens that have washed ashore on beaches or have been accidentally caught by fishermen. 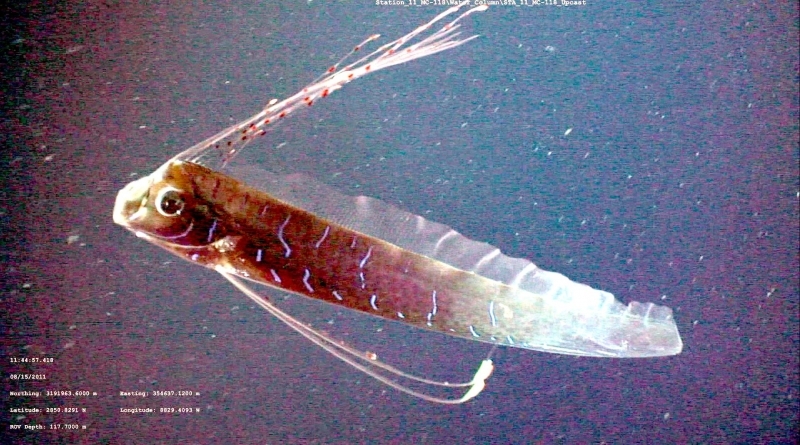 They have been known to come to the surface at night, apparently attracted by the lights of the boats. 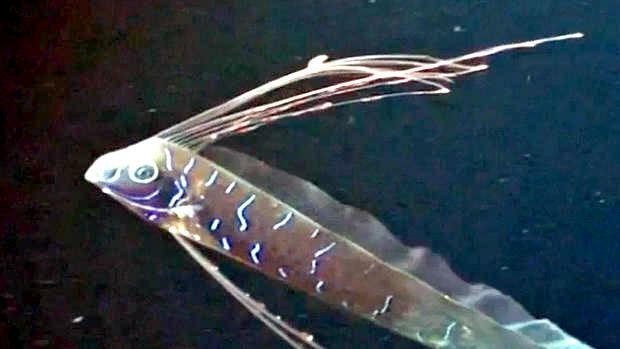 In 2001, a live Oarfish was filmed for the first time. 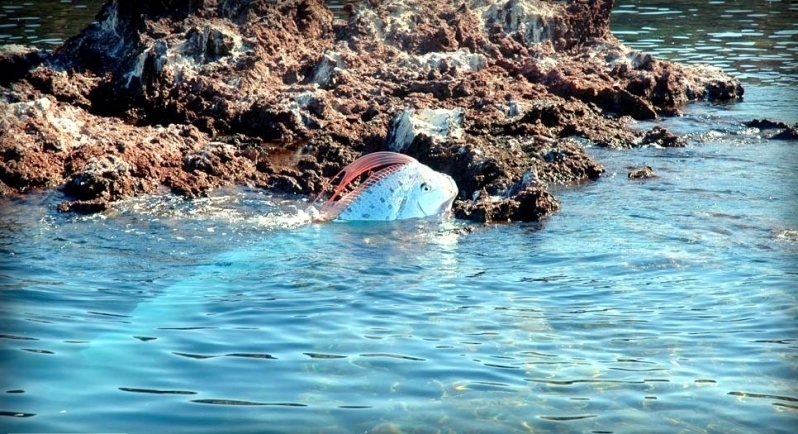 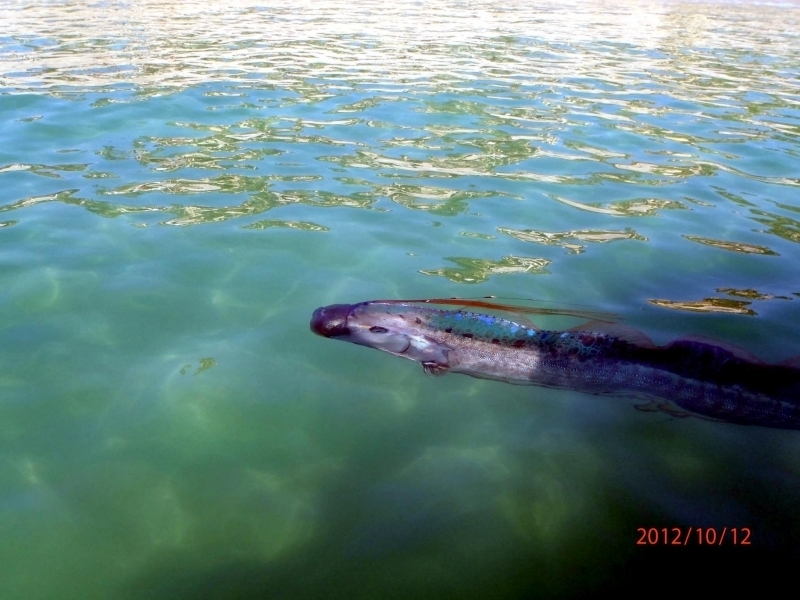 It was spotted by a team of US Navy personnel repairing a buoy in the Bahamas. 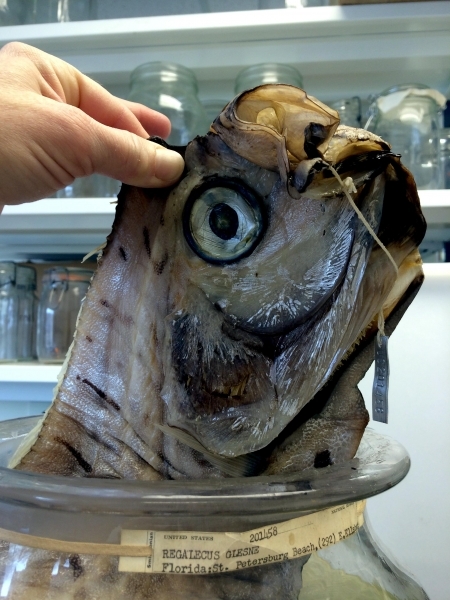 This specimen was observed to be swimming by undulating its long dorsal fin while keeping its body fairly straight. This type of propulsion is known as an amiiform mode of swimming. 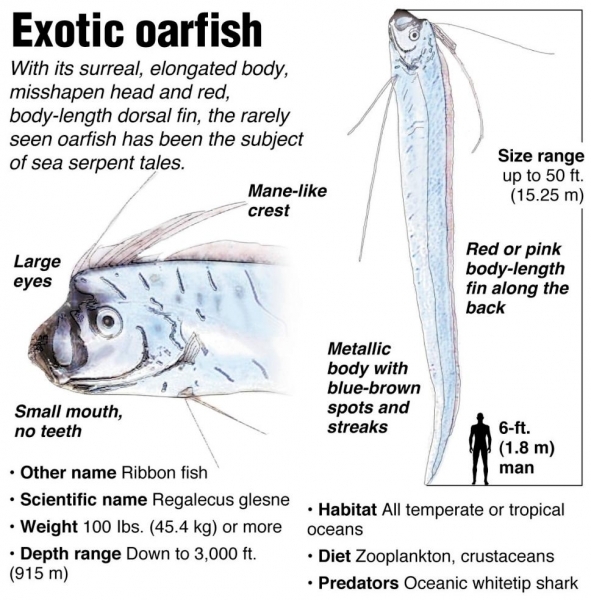 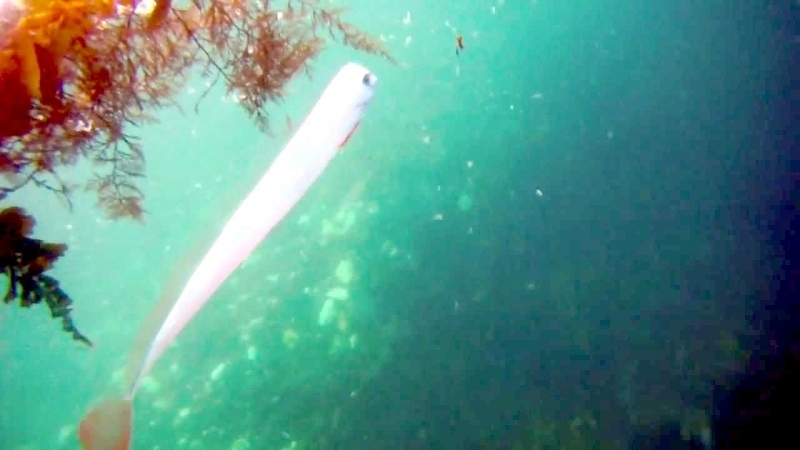 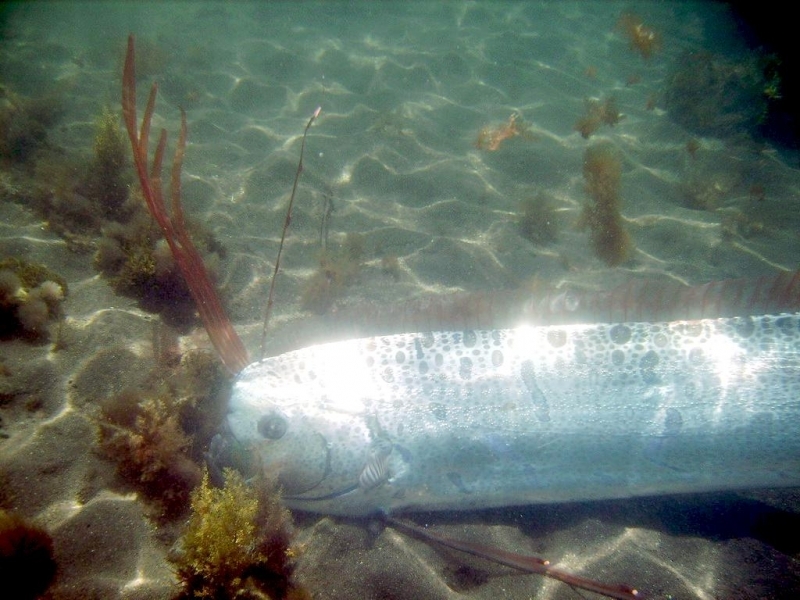 Oarfish have also been observed swimming in a vertical position. 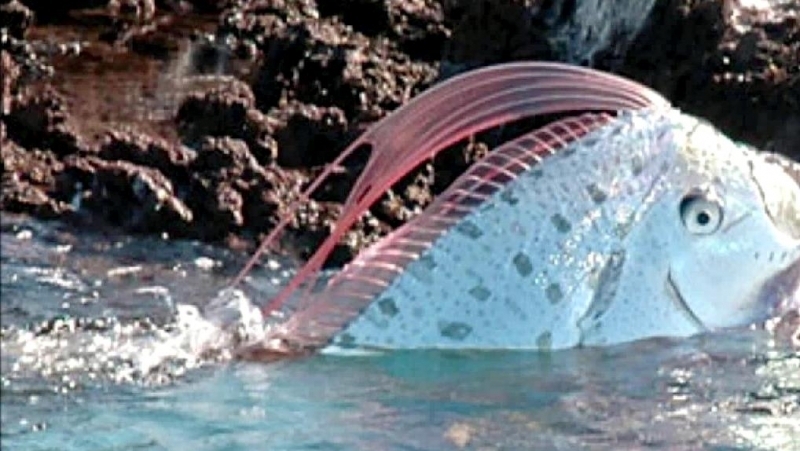 It is believed that this may be one way that the Oarfish searches for food. 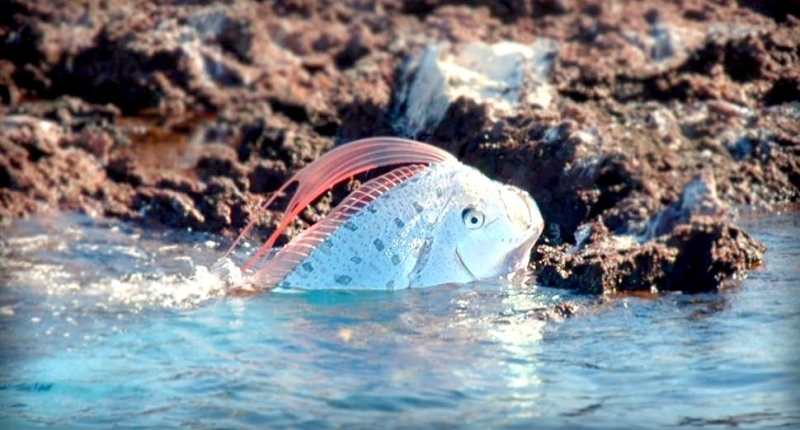 Little is known about the reproductive habits of the Oarfish, although they have been observed spawning off the coast of Mexico between July and December. 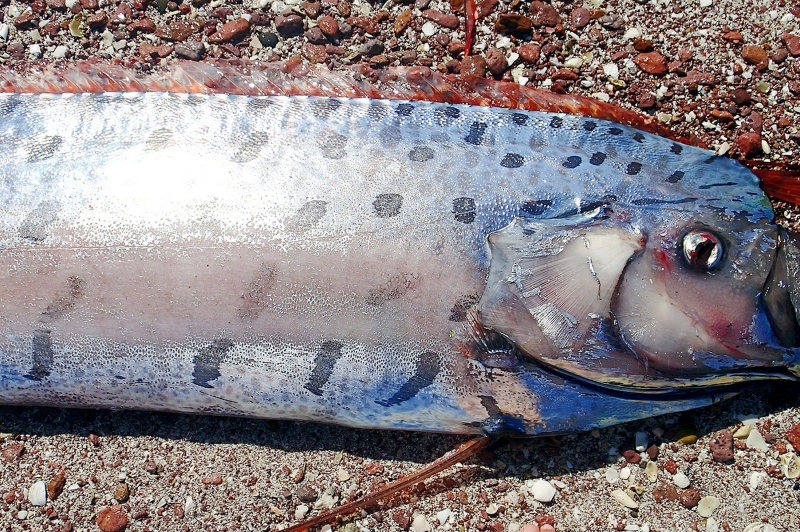 After spawning, the eggs are abandoned by the adults to float on the ocean surface until hatching. 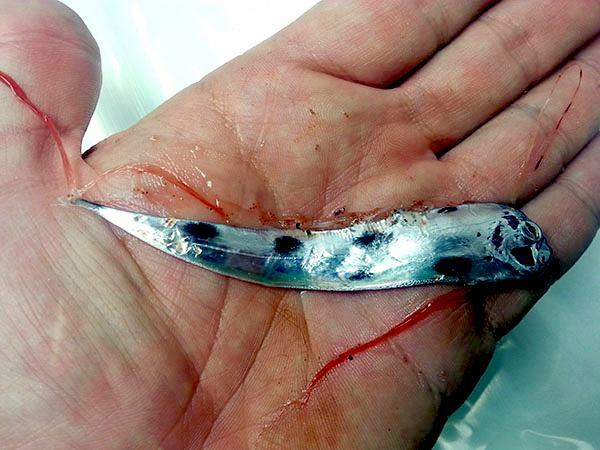 Once hatched, the tiny larvae feed mainly on plankton until they mature. 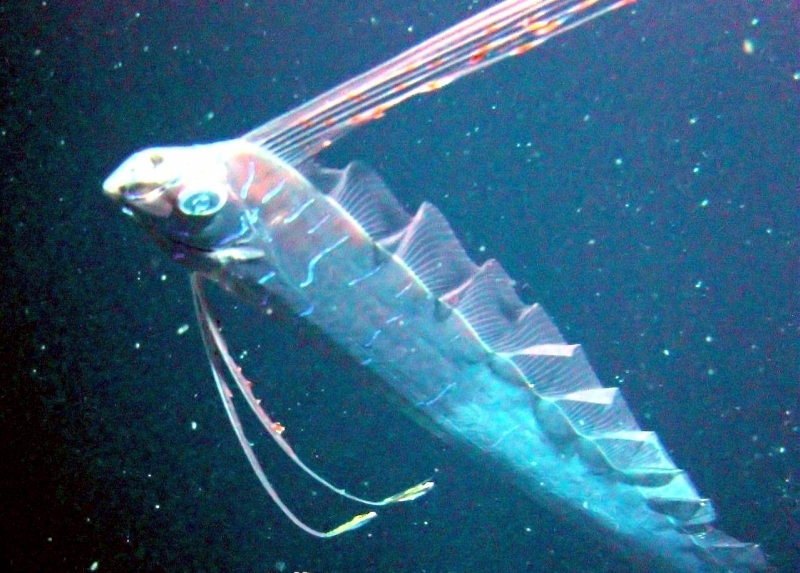 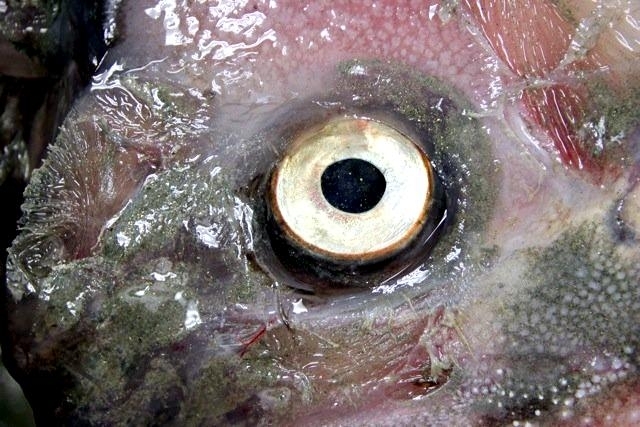 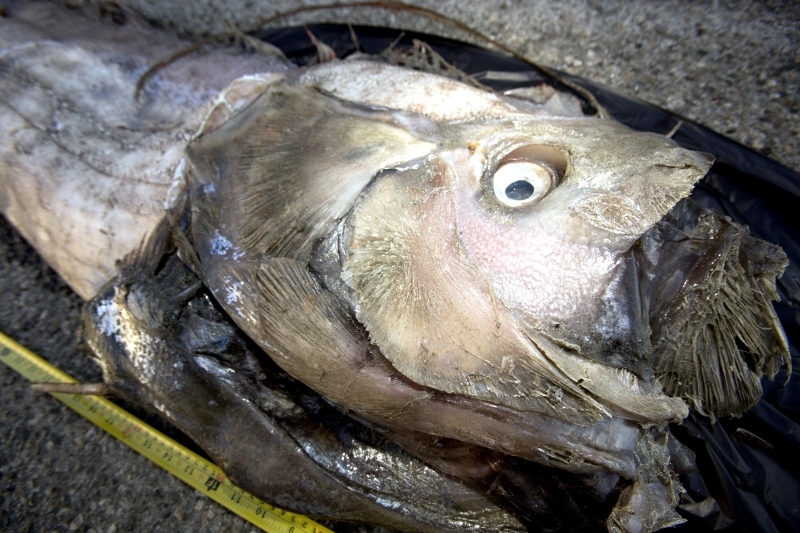 Adult Oarfish are thought to live solitary lives. 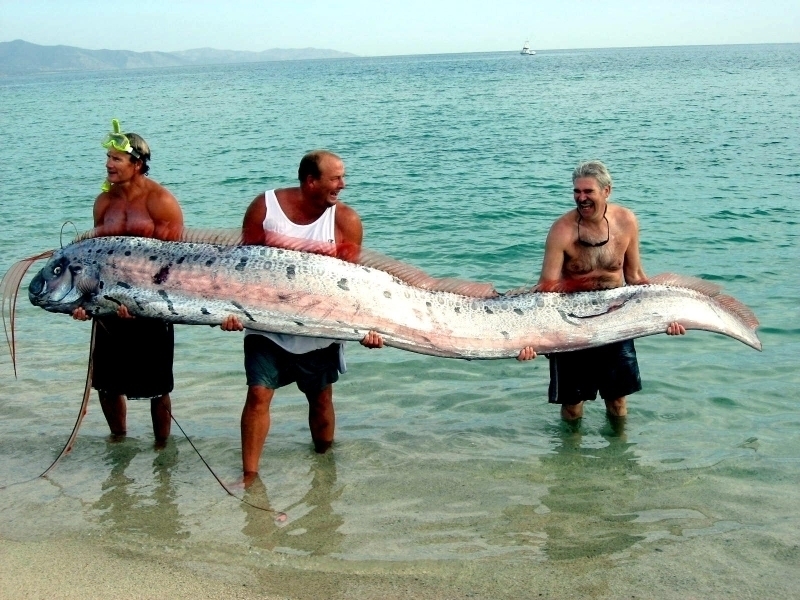 Oarfish are a pelagic species found throughout the deep seas of the eastern Atlantic Ocean and Mediterranean Sea. 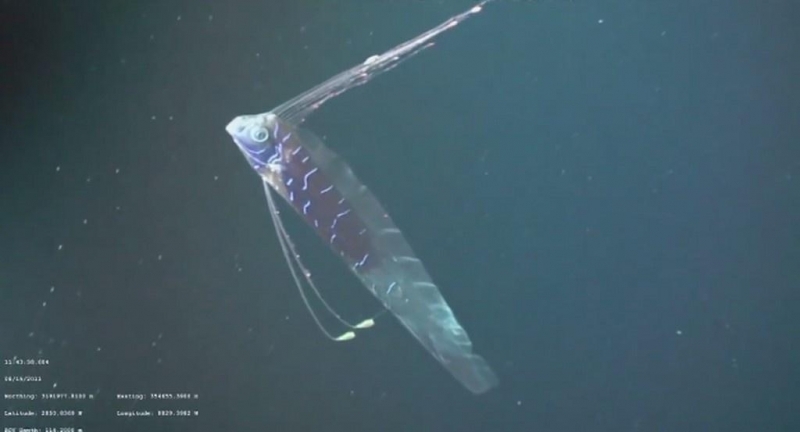 They are usually found at a depth of around 600 feet, although they have been known to go as deep as 3,000 feet. 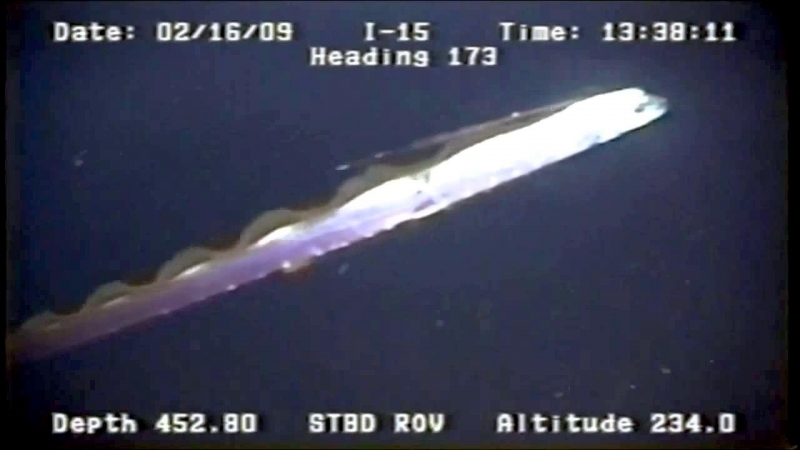 They have also been observed at depths as shallow as 20 feet. 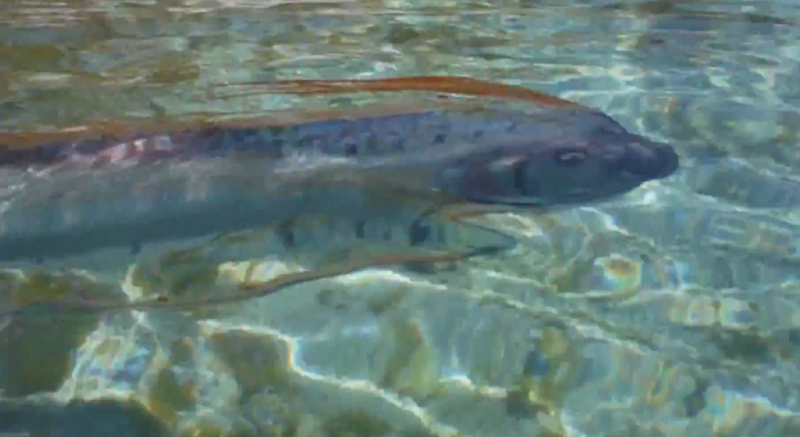 It is possible that they move to shallower waters as they search for food. 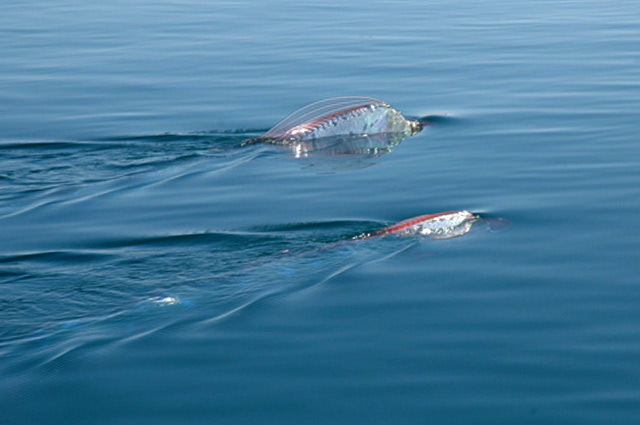 Though rarely seen in the wild, their numbers are thought to be abundant enough that they are currently not considered to be endangered.